Lights are a legal requirement on your bike, and vitally important to help keep you safe on the roads at night. However, with so many out there, how are you supposed to go about choosing a new set or your first set? Have no fear, London Cyclist is here! If you are cycling only on-road in London then you don’t really need to light the ground in front of you and your primary concern will be others seeing you. However, if you use unlit roads on your journeys in the dark, then you will need something a little stronger to light the road. If you are commuting through the winter regularly, then USB chargeable bike lights are good for your wallet and the environment. The models we’ve chosen below use battery technology that holds the charge for longer and can be recharged regularly without worry about decreasing the lifespan. Alternatively, if you don’t cycle as regularly then regular battery powered lights means they’ll work between longer breaks and can be replaced from most corner shops in a pinch. It is also useful to consider how long you need your selected power source to last. Do you have a fairly short commute or do you need the light to last all night. If you have a commute of an hour or less then you can pretty much pick any light currently available. However, for extended use such as an event, or in situations where you have no recharging options during the day, then ensure the light lasts long enough in the mode you are most likely to use. Size matters in many things, and bike lights can be one of them. You may not have much space on your handlebars and need a compact light. Or you may be intending to keep them in your bag most of the time, just incase you get caught out in the dark. Of course, larger lights have bigger batteries, so if you need to use the lights for long stretches then bigger may be better. Last but not least there is the cost of the light. Occasional use lights don’t need to break the bank. If you are regularly riding in the dark though, it is worth spending a little money on your lights. Cost determines features and construction quality, and lights can take a battering on a bike and in a bag through through the winter. This is the most common type of bike light and is what I was riding with that night. If you are cycling somewhere such as central London then these bike lights are generally good enough to be seen but tend to do little to light up the road ahead. At this low price point the Raleigh LED at £13.94 for both front and back bike light provides excellent value for money and just look at all of these positive reviews. The battery powered Lezyne Femto lights are great emergency lights. They are bright enough that you can be seen on the roads of London, although they won’t light up the road in front of you. They turn on with a simple push of the lease and have multiple settings. At £14.99 they are great value for money. The bike lights in this category up the ante. They are good for those rides along routes with less light. Especially cycle paths and country lanes. They also provide better visibility for drivers to see you. The Knog Blinder MOB (£32 each) is a great little light. It is USB rechargeable and has plenty of power. The battery holds its charge for a good length of time while you are not using it. Available in a front a rear version, they are small enough to keep in a pocket and easily loop around your bars or post. Another Lezyne winner, the KTV pro set has a high powered front light and a very visible rear light. At £27 they are great value for USB rechargeable lights and work well in the city. Each light has several settings so you can flash away or have a bright beam. I have been using these for a year and get on well with them. These bike lights provide a much stronger beam and are suitable in areas when there is no street lighting. Portland Design Works make really high quality products, and the Lars Rover 650 is no exception. This is a seriously bright front light, with its high beam setting clocking in at 650 lumens. It is USB rechargeable and will hold its charge for at least a few months when not in use. The Blaze laserlight is a beautifully made, incredibly robust front light with a special trick: the LED is accompanied by a green laser image of a bike which projects a bike on the ground several meters in front of you. 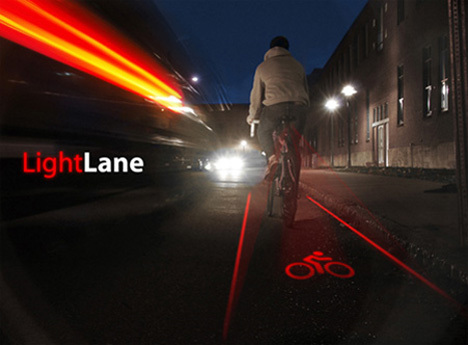 The aim of this laser is to increase your footprint on the road and alert others to your presence before they are directly next to you – perfect for London. The 300 lumen LED part of the light works independently from the laser and has two brightness settings and a flash mode. It is certainly bright enough to light your way across darkened paths. Generally very useful for mountain biking as helps with avoiding obstacles such as overhanging branches. A popular model is the Exposure Joystick which you can also buy with a helmet mount. It provides a ton of light and is incredibly useful for night time mountain biking or cycling along the canals. These are lights that are powered through the pedalling motion. Unfortunately I have little experience in this area as I don’t have a Hub generator so I can’t recommend a good light. If you have suggestions then please leave them in the comments. Fibre Flare – An alternative way to be seen is to grab one of these Fibre Flare lights. They are very bright and are designed so you can be seen from all directions. Also they are flexible so can be placed anywhere. What bike lights do you use and recommend? Do you have any specific lighting strategies to share? Let us know! My bike lights cost maybe 10 pounds total and are absolutely fine. If you cycle in a city there’s absolutely no need to spend more. Agreed! £10 lights basically help you be seen and often that is all that is needed in a city environment that has plenty of street lights. You’ve ignored dynamos – higher upfront investment but no batteries running out on you. I have a hub dynamo on my town bike and a bottle dynamo on my tourer. Much brighter than battery lights of the same price range, and if you get one with a standlight it’ll stay on when you’re stopped at the lights. All you need. You flew to Birmingham and took your bike? Your price ranges have gaps e.g. £25-£100? RE: £25 – £100 true, I was just trying to simplify by not adding too many categories. I have listed a light in the £70 price range. If you have any recommendations I’d be up for hearing them. Alien8 has already suggested Fenix LD20 as opposed to the Hope Vision 1 so I’m looking around and considering changing it. I have recently bought a SSC-P7 1200Lumins LED Bicycle bike HeadLight headLamp Light which can be found on ebay. It gives a really impressive bright beam. The cost including p/p is just over £50. When you see one coming towards you, it looks like a car headlight. You won’t be disapointed. All my friends now have one. Ah…I am in search of bike lights as the dark is setting in earlier. Agree with above poster that you have overlooked dynamos. I seem to recall having a bottle dynamo as a youngster. I cycled 12 miles to school then (round trip). I recall that the weight of pedalling against the dynamo was like pedalling through a ford or fjiord or worse. I never did establish whether the dynamo was defective or whether this was how they work. I have never had another one!! Can anyone throw any illumination 😉 on my experience?? Thanks for comment Titan, made for amusing reading. I’m fairly sure dynamos these days would not slow you down otherwise I don’t think anyone would ever use them. Though I admit this is an area I’m new to so I need enlightening 😉 too? I remember having dynamo driven lights when i was a kid at school. The answer is fairly obvious and Titan is right. You have to put force into a dynamo to get energy out. the energy needed comes from pedal power which is added to the the effort to move the bike, it used to feel like a sticking brake. AFAICT, it’s impossible with a hub dynamo to tell whether the lights are on or off, from the point of view of the effort required. I don’t know what the drag from a side-wall dynamo is like as I haven’t used one in decades. With a hub dynamo (see my post below), the lights are illuminated at walking pace. From about 6 mph the lights are seemingly at maximum brightness. With a 3 Watt dynamo, it’s possible to run a LED headlight and two LED tail lights. The most detailed reviews of bicycle lighting I know. I think that in the city there is also a need to have back up lights. How many times do we realise that the front light isn’t blinking as strong as it should? Ah….time to recharge or change the batteries! As back up lights i use Knog bike lights. At the back i use Knog Gekko, and at the front i have a Knog Beetle. They are amazingly bright, but i wouldn’t use them as a main source of lights. They are also very discrete so won’t clutter your bike up. I think that the brighter the light the better, even in an urban environment. Just because there are streets lights around does not necessarily mean that car drivers will be able to see you. You need a strong light that can be seen from a distance and I’m afraid that a feeble little flickering led does not cut the mustard. I ride with two lights on the rear, one flashing and one static and the same up front. As an aside your review stated that the Hope Vision 1 has two power modes. It has four, minimum, normal, high and maximum plus flashing. Thanks Jon for picking out my error. Considering changing the Hope Vision 1 to a different recommendation anyway. Have you tried the Fenix LD20 bike light? No, I haven’t tried the Fenix, looks nice though. I bought the Hope because at £72 and 240 lumens it gives the best ‘bang for the buck’. The one down-side to the Hope is that there is no low battery warning, it simply dies when it runs out of juice so a backup light is a must! This aside it is very well made, from machined alloy, and very bright. Thanks for feedback on the Hope, I read around and people seem fairly pleased with it. At US $85.00 you should really look at the Magicshine bike light. Bar or helmet mount with a Lithium Ion Battery. Listed as 900 lumen but probably running at closer to 600 it is the brightest I have seen in this price class. Was so impressed that when i saw it I bought another one that is going to replace my Dinotte. Newer versions have fixed reported problems with overheating and construction is excellent. Don’t feel you have to have your bike light on full beam in London – we’d complain with good reason if cars did this, most of them dip their lights in built up areas. I had an after-image of a cyclist’s lights for 5 minutes in Oxford street last month. Not very safe. I have a £1 torch from poundsavers ziptied on my bike, next to the fitting for a £30 light which I will keep for if it fails, and every bit as good, and if/when a yob pinches it, well it was only £1! Rear is a Dinotte 400R Taillight. Yes the Hope is bright especially on it’s brightest mode but is fantastic in areas with no street lighting and as far as blinding anyone, probably best not to stare at it, you wouldn’t do it to a car so don’t do it here. The Dinotte is also very bright on it’s brightest setting, you can be seen about 3kms away in daylight, again not wise to stare at this. I also have a set of Pedalite pedals with toe clips, these are great because they also give you side illumination and have no batteries. This has cost me a small fortune as I also opted for extra batteries with both front and rears. I justify this cost because if I lost any work from being knocked off I’d really be out of pocket, I’m the sole earner in my household, not to mention the possible injury, it really is no contest. This all sounds very obnoxious in terms of light out put, but the point is to be seen and when riding in a busy city centre, with all the drunks, cabbies, mopeds, buses and urban 4×4 drivers you need all the help you can get, safety is first at ALL times. To strengthen my point further, I get at least one driver a month stop me at lights to say how useful it was to be able to see me at distance and really have a presence on the road. This is probably due to some of the so-called urban cyclists you can’t see at night, no bike lights, all in black and riding like idiots. You cannot put a price on your life, please don’t be a statistic get illuminated. I agree with your approach to being seen but your comments about drunks, cabbies, mopeds etc let’s you down – nobody will take any notice of the views of someone who sounds unbalanced in their opinions. I ride both on the urban streets of Manchester and the completely dark lanes of Derbyshire. I have good old fashioned halogen spot and wide lights at the front (from Lumicycle) and use the 12W spot for urban riding with a Knog flashing as well and a Cateye rear light which is bright enough not to be ignored. In the dark lanes, I switch on the 20W halogen which gives enough light to descend at up to 40mph in safety. In summary – for lighting up where you’re going, you will know exactly what you need, which will vary depending on how dark it is and your riding speed. For being seen, go for flashing every time. Static lights in an overcrowded uprban street will not get you seen however bright they are. I disagree with this statement. By your logic should car drivers switch off their lights? A blinking light may get you seen from a distance but in my experience a powerful front light does get me noticed by drivers waiting to cross at junctions especially when in close proximity. what do people think of the Knog Bike Lights? Are they good enough for riding around in London? A couple of my friends ride round just with the knog bike lights. I would say they are good enough for riding around London. They won’t help you see ahead of you (for spotting potholes much) but they are good for been seen. After seeing the Knog lights at the bike show this year I immediately tried to buy some. I went to that bike shop underneath Charing Cross Bridge and next to Victoria Embankment but when I enquired about the lights they told me that that they no longer stock them as they were being returned by disgruntled customers some weeks later as the straps had broken. I use a B and M bottle dynamo with their top of the range LED front bike light and rear bike light that has a large rear reflector built around it and fits onto the rear carrier. They have standlight internal capacitors which keep them lit for a few minutes if you are stationary. The dynamo is very efficient and you only have to be travelling at a couple of MPH for the lights to be on. I have to ride day and night and it is great not to have to worry about batteries or finding out on a dark evening you left your lights at home as it was light when you left! Having all the bike lights and dynamo bolted on the bike has meant that I dont have to take them off and neither has any body else! but it would be easy to change the bolts for security bolts if you wanted for added security. Just to say I use the Fenix LD20 bike light on the front. At full power it’s good enough to light my way through a pitch black Richmond Park, and on the flashing setting, drivers can still see you for miles. Use AA batteries, so I just pack a spare pair in my bag, and use rechargeables. Having also spent more (£75) on a ‘dedicated’ bike light which has all the crap of separate recharging cables, I’m even more convinced of the utility and value of the Fenix, frankly. Two separate points here: I’m a fan of both headtorches and hub dynamos. A front-light option I haven’t spotted in the discussion here but find useful: a regular hiker’s head-torch. They’re small, robust, light-weight, and cheap. I have one that I picked up in my local supermarket for €2.99 which takes three AAA batteries and has three settings: 3 bright LEDs, 6 bright LEDs and nine bright LEDs. The batteries last for ages, and when they fail, I’m generally carrying a second headtorch with fresh batteries, so no mucking around with batteries on the road in the dark. The headbands can be used to fix the lights neatly to the handlebars of any bike – I can hand someone I’m out with a spare light if necessary, or I can use my spare as an actual headtorch if I need to look around as well as focussing on the road ahead. I use those on my mountain bike and on my road bike. Semi-legally, as they’re not approved bike lights where I live Germany. If I were to use them on my town bike, they would be utterly and totally illegal, as all bikes over eleven kg have to have a dynamo system installed. While that’s propably over-prescriptive, there is a grain of sense in there somewhere. I think a hub dynamo should be the default lighting system on a bike that’s mainly used as a town-runaround. None of the disadvantages of bottle dynamos and all the advantages. Not hugely expensive to install, cheap and convenient to run, hard to lose…. I’ll be spending a few days in deepest darkest Kent shortly – and being a fairly new cyclist have been thinking about lighting. I have a run-of-the-mill Smart light on the front which I’ve only needed to use once in the city so I’ve been doing some research. The headtorch seems to be a good option, tho not sure whether to use it on head or bike. I tried some out in the Cotswold shop in Covent Garden and the best one, I thought, was the Black Diamond Spot at about £43. I live in rural kent and my commute involves a rural bit on Romney Marsh as well as an urban bit in town where, as the article says cheaper lights work fine. I have Knog bullfrog lights front and rear, a light powered by a hub dynamo and a torch on the handle bars. the Knogs are very bright and do the ‘I am here, please do not run me down’ bit. Dark where I live really is dark and I need to see the road because it is really crap in places with potholes that could cause serious damage to me or the bike (thanks KCC): a dynamo light – a lumotec with stand light function (cost £44) provides a lot of illumination (50lumin) and I can see the road pretty clearly just in front of the bike but I supplement it with a Ronisen torch with a CREE diode, which is mounted on my handlebars using a contraption costing about £10. It knocks out 250 lumin and is very very bright and makes the road surface very clear for about 5 to 10m in front of the bike and clear enough beyond. The torch came through ebay and cost about £12 and is powered by a powerful laptop battery (cost roughly the same) and runs quite a time between charges. In the country, it is important to be seen and to see – drivers are worse than London drivers as they do not expect to see a bike. I find that the MagicShine lights are quite good. They don’t cost as much as the other more expensive models, but perform just as well – if not better. They look nice and are made very sturdily.. I really don’t think you can go wrong with them! Why are most cycle lights designed with the “on/off” switch on a hair-trigger so that, they invariably switch themselves on when jogged against anything else in your bag – meaning you have to take the batteries out between use, which is a bit of a pain. Anyone got any suggestions? I’ve been using an Exposure Joystick for the last 18 months and have recently bought another one. If I’m using the road bike, I tend to have them dual mounted on the bars but when out on the MTB over the woods, I have one on the bars and one on the helmet mount. Yes they are blooming expensive but what price on your safety. It has to be seen as an investment if you are doing serious miles at night. @Rob, you have to double-click the joystick on so no chance of accidentally turning the light on in your bag. I have hub dynamos fitted to both my Brompton and Batavus. They are both fantastic bits of equipment and adaquate for the type of cycling I do which is mainly urban and commuting. I dont live in London where it also seems the risks to cyclists at night are double that of any other part of the country, but I do back up my dynamo systems with a good selection of LEDs. One of the many positives about dyno hubs is the long term cost – no batteries. Also, they dont have to be removed from the bike everytime it is left. With the approaching Autumn and Winter, I recently fitted a Shimano hub DH-N72 dynamo (built into a wheel by Spa cycles); Busch + Muller Lumotec IQ Fly (this is the dynamo version of the battery-powered Ixon IQ) and a TOPLIGHT Flat S plus to my son’s bike as he cycles to college and like most teenagers, he has a problem with organisation (keeping batteries charged etc.). The B+M TOPLIGHT Flat S plus is only just out and it’s superb. It sends out a flat beam of light that gives drivers a much better idea of their closing speed. I got my (his) B+M lights from Bike24. Brilliant (in more than one way)! I have two other bikes that have hub dynamos, one Schmidt the other Shimano and both have B+M Lumotec IQ Fly headlights and each have 2-off B+M dynamo rear lights, plus battery flashers. Many of these very bright lights that cyclists are using are illegal. Effectively we have the problem of overlapping legislation and it’s produced a confusing mess. Naturally, many cyclists think a light’s a light. They couldn’t be more wrong. Just because a ‘bicycle light’ is offered for sale doesn’t mean it’s well designed, reliable, robust or suitable for use to alert other road users to your presence. Lights that dazzle would include most purpose-designed mountain bike headlights intended for off-road use that have a generally circular beam geometry – these have no beam cut-off and were never designed for use on-road. They’re very bright and are likely to dazzle drivers. If they weren’t so bright, the beam geometry would be unimportant. That’s why most (if not all) such lights aren’t German StVZO approved, they’re almost certainly not legal for road use in the UK. Let me make it perfectly clear: lights that dazzle are as illegal as no lights at all. I refer you to the CTC’s guide to the Road Vehicle Lighting Regulations. Important performance criteria of properly designed bicycle lights are: brightness; off-axis visibility and a substantial arc of visibility, above, below and either side of the light’s central axis. Well designed optics and beam geometry. Presumably waterproofness; ruggedness; reliability and battery life would also be assessed. Purpose-designed road lights would be BS approved; German StVZO compliant “K~number”, or Eu member state equivalent approved lights. These lights must bear the approval marks. No marks=no approval. So just because a light’s blindingly bright, doesn’t automatically mean it’s safe to use, in-fact the opposite may be true. I Disagree. The majority of car headlights are far brighter than the bike lights in use, in and around London, that I see on my travels. As long as you point the light at the ground and not in the air you are unlikely to dazzle anyone. Of course mountain bike lights are the exception, but these rigs cost an arm and a leg and I don’t imagine many people use them for their commute to work. You are free to disagree with me, but lights that dazzle are illegal – that’s it, no ifs or buts. Note, the argument won’t be with me, but with Plod and the court. And it’s almost certain that the arguer will lose. You don’t have to look far to see or read about cyclists using illegal lights on on the road. With the increasing brightness of lights, the Police are already taking an interest. I’ve already heard of a cyclist being told to turn off his Hope Vision 1. Without a second light that means a long slow walk home. There are some very good and very bright road-legal lights out there which are far better than off-road lights for numerous reasons. Cyclists are already widely considered to be the lowest form of life on the road and illegal lights are a very bad idea for the very reasons which I believe I’ve made abundantly clear. There are already enough lawless cyclists out there giving us a bad name. All cyclists need to abide by the rules. It’s very selfish to make life for cyclists even worse than it already is. There really isn’t any excuse. I am not condoning ‘lights that dazzle’. All I am saying it that car lights are brighter than a humble bike light. A bright bike light, properly adjusted, pointing at the ground is absolutely fine. It will not dazzle any more than a car’s head lights. If we were living in your world cars would be equipped with 40 watt bulbs, not high power halogen lights, because they might dazzle someone daft enough to look directly at them. I have a Hope vision 1 and its a great light. I usually ride on flashing/low power except when I need more, in dark roads or parks. Should I be penalised because it is not approved? Of course not. Do I care if it is illegal? Nope. Can the average police constable or car driver tell the difference between it and a legal light? I doubt it. I have never been stopped by the esteemed Metropolitan Police and most certainly never will. They have much more important things to be spending their time on. Like speeding drivers, drunk drivers, drivers talking on mobiles etc etc. I think you are labouring under a misconception. Some of the lights I mentioned are probably much brighter than any road legal bike light you’ve ever seen. Of course some off-road lights may put out more light, but it’s completely wasted on-road and some of that wasted light will dazzle, unless the light is virtually pointed at the ground and then what’s the point of that? As an example: Last night I was returning home and just as was I passing two stealth cyclists on BMX bikes on the pavement (I was on the road) one of them said “bloody hell” as I went past. I can only assume one or both were astonished at my lights. And my dynamo powered B+M Lumotec IQ Fly headlight only throws out 40 Lux measured at 10 metres. Sorry about the mish-mash of units. Road-legal bicycle lights – all currently available. Finally, I suspect that you misunderstand my motives. One problem with legal matters is such things get discovered when something has gone wrong. It is perfectly feasible that a cyclist could blamed for dazzling a driver involved in a crash in which the cyclist may or may not have been injured and then the wheels of justice could find that the cyclist was at fault for using an unapproved light and this could affect their liabilities or compensation received. It’s really important to try to be road-legal, because it could prove extremely expensive later. Now nobody would want that to happen, would they? PS Third part insurance is a really good idea, it’s included in membership of the CTC and some other cycling groups. Something less to worry about. Slightly off-topic, but only slightly. If you tow a bicycle trailer, you may be surprised that AFAIK, even new trailers do not comply with the law. If you tow a bike trailer after dark, the trailer needs a RVLR compliant rear light and a TRIANGULAR REFLECTOR, bike trailers ALL apparently use standard bike reflectors, which are the wrong type, as mine did. I only commute in London and since it got darker I had 2 small accidents (one of them had my rear wheel completelly destroyed bending my hanger). I decided investing more on lights because even thought I’m very aware of the environment Im, I, as everyone else cant predict ppls actions. A week ago I passed through a cyclist that had a very bright flashing light that looked more like a camera flash. Having in mind my past experiences I decided buying one, they do cost >£100 but are worth since Im much more visible now. People tend to try to blame everything on cyclists but in the end we mostly pay for the others recklessness. I use these on low power for commuting (and long run times) and full power for off road. rear light is super bright and runs off same battery as front light too. superb lights, cracking value and one set for all jobs. I use the Night-Nemesis light from Full Beam. They’re not intended for road use but in London traffic I think it is extremely important to have a powerful and wide beam light. The Night-Nemesis is much brighter than my Lupine Betty and does’t over heat like the Betty does. The Full-Beam light has a far wider beam pattern so trow lots of light to the side, grea for off road, on-road it discourages cars from pulling out of side roads without giving way. They’re not cheap but when compared to other companies’ offerings they’re real value for money, especially if you ride off-road. They’re leagues ahead of my Hope Vision. I’d like a helmet mount version for off-road use, just for when I’m messing off the bike like when I get a puncture, but then again, that would probably mean I get pulled over by the Met’ when I used them on the road! Another plus point is the’re a UK based company, so in times of economic decline it’s always good to look after your own. I’ve added a link to their site but their shopping cart page seems to be down? Maybe out of stock? Anyway they got some good reviews from the mag’s so if you’re considering a new front light make sure you look at their offerings. Check out cyclelogicalgear.com they have awesome spoke reflectors that require no batteries. This patent pending technology is awesome and easy to get you on your way to extra visibility at night! Extra reflectors are a great idea, but good lights are not only a legal requirement, but are essential. One only has to cycle at night to see that some drivers drive without lights, and reflectors rely upon reflecting incident light. Excellent reviews of dynamo lights. That is a photoshopped picture. It doesn’t seem to be on the market yet. I bought on of these last year. Still same price £100. Not cheap but what price is your life?! My commute is half in the city and leafy suburbs & the countryside so a good light is vital. Built like £300+ lights (milled aluminum body and waterproof battery housing.) Great spread of light for road and off-road riding. I thought the batt would be rubbish but still charging and holding it fine. My commute is 1.5 hrs so the 2.5 hr burn time is never problem. I do take the small light charger to work to top up during the day for my return journey and then stick on over night charge for next day. If in lighter summer months use it on flashing mode and don’t charge at work. BTW get the 1m extension at the same time (saves postage) and makes a fine head torch for camping but don’t forget never look at someone around the campfire; it is sooo bright!!! I live on Romney marsh so part of my commute involved cycling through the brightlights of london to StP and then an often pitch dark ride across the marsh in narrow country lanes. I experienced these problems when I started doing the run regularly. I think a budget option for a light you can use to illuminate the road is to buy a torch with a 5w cree diode, I found a brand called Renisen which was very cheap. they are powered by a massive battery and will put out light for a week between charges. There are attachments you can buy to fix the torch to your handlebar. For dark rural riding you should not rely on one light always working as you may forget to charge or swap the battery. Standing at a rural railway station with no alternative transport with no lights in the pitch black, wondering what to do – misery. One of my learning points was to have a hub generator (these can cost as little as £30) and to run two Busch and Muller lights off of it (front and back). Both have a capacitor so will run for 5 to 6 mins when you stop pedalling. The front also has a circuit that means it will switch on or off depending on ambient light levels – genius, The front light LUMOTEC FLY puts out about 2.5w through a bulb and has a back up LED for when you stop, the rear TOPLIGHT is an LED between two red reflectors puts out about 05w and is visible for some distance. The capacitor is essential but getting new bulbs can be a pian. I have knog lights as further back up. I would really like to encourage the use of helmet lights. Firstly they are a great back up and you can turn them on whilst on the move. Secondly they are far less likely to get nicked. Lastly its not always obvious when your rear bike light is running low on energy, or has failed completely. I have frame mounted LEDs front and rear anyway, as well as reflective tape wrapped around the frame. With the dark evenings I’m back using my excellent Niterider light on a commute down a long, pitch-black cycle path. There seems to be a new trend this year in that people try to shield their light when another cyclist is coming the other way. Bright lights don’t bother me as I just tilt my head down to use my peak to shield the light and keep left (assuming the other cyclist is keeping left!). I tried this light shielding business and didn’t feel comfortable racing along with one hand on the bars and potentially not seeing the pothole, wood, stone, rabbit or, more importantly, the walker in dark clothes just beyond the oncoming cyclist. You do get the odd ‘shirty’ comment, which is unusual amongst cyclists, but i just think, ‘get over it’; it’s only a bit of glare and I’d rather not have to explain to people that the reason I ‘totalled’ myself was trying to shield my front light. I know of someone who had an unexplained crash (no car involved) and had a head injury. He has never returned to work. I’d rather not have the fact that I totalled myself was because I was dazzled by your over-bright lights shining in my eyes. sounds like your light is ideal when there is nobody there, but it is inconsiderate when there is. What would you say if someone’s illegal off-road dazzled you and caused you to fall down a manhole which had a missing cover? Lights that dazzle are illegal, and the people that use them on roads and cycle paths are selfish and should be ashamed and must stop using them any more on the road and cycle paths. Tonight I encountered two cyclists with illegal off-road lights. It was dark and they were travelling the opposite direction and rendered everything apart from their beam invisible. With the first one, I saw his lights looming around a bend I flipped-up my StVZO & BS compliant headlight which was legally adjusted to drop a hint about his light, and shouted ‘dazzle’. In response he shouted back ‘adjust your light’. He obviously hadn’t a clue. Obviously a half-wit. The second remained silent when I shouted ‘dazzle’. Please ONLY use off-road lights with conical beams in off-road circumstances. Use anywhere else is antisocial, selfish and give cyclists in general a bad name. Such lights could easily lead to a collision. Please, only use road-legal lights on the road. The design of the beam geometry is there for a reason. Lights that dazzle are illegal. Information about road legal lights, beam geometry etc. I have tried induction-powered lights from Reelight, with mixed results. I’ve had some fragile ones break, but the basic idea is brilliant and when you get a good one they do work really well – bright enough, always on, and you never need to recharge them. Recently I’ve taken to using the “Black Widow Front and RSP 5 LED Rear Light USB Rechargeable Light Set” (available from Amazon under £20 the pair). Both are more than bright enough for city riding and recharge from your PC once a week. Perfect for the commute. Thanks for the review. The biggest problem I have though is the with the way the light is attached to the bike. I’ve lost several sets of lights because the mountings have broken or slipped off the handlebars and the lights have smashed as they’ve hit the road. B) Go for a Knog light that uses the silicone strap. I’ve never had one of these come off.